You’ve chopped down a tree on your property, and you’ve cleaned up all of the pieces except for that unsightly stump. Instead of trying methods that will either break your wallet or break your back, try either burning or rotting as a natural way to get rid of a tree stump. Below you will find a list of what materials you will need to burn a tree stump as well as directions on how to do this yourself. A few general, common-sense tips before you get started though: Always check with your fire department before you get started, and never burn your stump during a burn or fire ban. Also, make sure that you store your potassium nitrate in a safe location because the substance is a well-known explosive. Attach the spade bit and the extender to your drill. Drill a hole from the top down into the center of the stump with your drill at a 30-degree angle. The hole should be about eight to 10 inches deep. Clean all of the debris out of the hole. 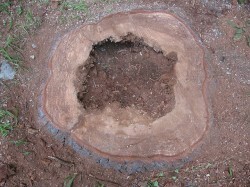 Continue boring holes in the stump, leaving about one inch of space between each hole. Use the plastic scoop or trowel to scoop potassium nitrate into each hole. Pour hot water into each hole. You can either dip a cup with a spout into the bucket or insert a funnel into each hole and pour the water directly from the bucket. Continue pouring water into the holes until all of the potassium nitrate has dissolved. 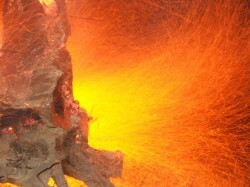 The hot water will help to distribute the substance through the stump. Place the scrap wood on top of the stump. Alternatively, you can construct a tepee-like shape with the wood, placing one end on the ground and bringing the ends together above the stump in a cone shape. Light the scrap wood and wait for the stump to ignite. Allow the stump to smolder until all of the wood has turned to ash. Use your shovel to break up any large roots or stump pieces that are left over. Bring in soil to fill the hole as needed. Below you will find step-by-step directions on how to rot a tree stump yourself as well as a list of materials. Before you get started it’s also a good idea to keep in mind the following tips: You can speed up the rotting process by using a high-nitrogen source like potassium nitrate. You can also try natural sources of nitrogen like blood meal, fresh manure or compost. Drill holes into the stump using the spade bit and extender. The holes should be eight to 10 inches deep and drilled at a 30-degree angle. Use the plastic scoop or trowel to fill the holes full of your high-nitrogen substance. Dip your plastic cup with a spout into the bucket of hot water. Pour water into each hole. Alternatively, you can insert a funnel into each hole and pour water in directly from the bucket. Keep pouring until the nitrogen source is either dissolved or soaked. Use your shovel to chip off pieces as the stump gradually softens. When the stump is gone, fill the hole with dirt as needed. By using either burning or rotting, you can easily get rid of tree stumps without expensive or labor-intensive methods. Then, you can either relax in your hammock or play a game of baseball in your stump-free yard. Hypothetical: I use the method for rotting out a stump via potassium nitrate. Once the rotted stump is gone, I want to plant another tree in (or near) the spot of the old one. Would that be a problem, or would the new tree be fine?